Dr. Jwing-Ming Yang, PhD., has dedicated his life to Chinese martial arts. He's the head of Yang's Martial Arts Association, which boasts more than 50 academies in America and Europe. Years ago, Dr. Yang sold his share of the company and relocated to the Salmon Creek watershed community. Over the years, he's built a ridge-top homestead and live-in training center that can house up to a dozen full-time students, with spare rooms and camping accommodations for guests. For Yang's students, life begins each morning with an hour of meditation. Then they proceed down the steep hill to the creek, and run back up. The climb back up takes about 15 minutes at a full run, but some of the younger prodigies have been known to do it in 10. The rest of the day breaks down into two-hour training sessions in chi-gong, tumbling, training for speed and balance, and Kung Fu. "Kung Fu means hard work and time," Yang says over a mug of green tea. "You go to China and say you've learned Kung Fu, they ask, 'What kind of Kung fu?' Painting? Anything that takes you a lot of time and energy to accomplish is called Kung Fu." From the far side of the room you can smell the pot of yam and ginger he's making for his students, napping in a modest bunkhouse nearby, with room to accommodate a dozen full-time students in the YMAA's five and ten year programs. Yang has also built a fully equipped training hall, a sauna and a gazebo for meditation, and an impressive guesthouse. On www.ymaa.com, this off-grid homestead is listed as YMAA's international world headquarters. "My dream is to preserve this art before I die. In another five years, I'll be 72. Think about it," he says. "The next ten years is a precious time for me. If I can put a few seeds down before I die and give them the knowledge I've learned, it may spread." In addition to their traditional curriculum, students take lessons in writing and video production. Yang calls it a way of communicating with the outside world as the author of more than 30 books. He's also produced a series of instructional DVDs. "It's how I survive," Yang says. Like dance, martial arts cannot be taught through books and DVDs alone. It takes hard work, face-to-face instruction, and frequent practice under diligent supervision. For roughly 1,500 years, Shaolin monks have passed down their version of Chinese Kung Fu through the monastic tradition. Monks worked, meditated and trained together as a full-time way of life. That's how their knowledge has been passed down from one generation to the next. For the most part, martial arts in the Western Hemisphere has divested from the monastic tradition. If you learn Kung Fu, or any fighting art, odds are good that your school will be located in a strip mall or a former retail location. Students attend two or three classes, and train for just a few hours each week. Yang thinks that for many practitioners, this has led to a profound disconnection from the traditional roots of their art. "That's why this is a ten-year program. To bring people back to this ancient discipline," Dr. Yang says. Yang's five- and ten-year programs come with a diploma, and he encourages students to take academic courses online but without a general education program they are ineligible for accreditation. "Our focus is really about the training here. It's more of a vocational school," says Nicholas Yang, Jwing-Ming's son, who just moved to Salmon Creek in September 2012 to teach alongside his father. Nicholas has degrees in computer science and digital art. He's thinking of learning to program-write code for Nintendo Wii and Microsoft Connect, interactive gaming platforms that could soon be used to teach basic martial arts skills to faraway students. As a relative newcomer to the facility, he still regards himself as a student despite having spent the last five years operating a YMAA franchise in Boston. "I reached a point where I felt like I had plateaued, so I passed the school on to one of the instructors," Nicholas says. "I'm here now to take my training to the next level and explore my opportunities for the future." "I loved computers growing up, but something drew me back here," Nicholas says. "They always wanted me to find my own passion. They didn't want to force this on me. My father knew very well that this was his dream. A big part of it is mine, though, as well." In the training hall, Javier Rodriguez is practicing with weapons striking heavy punching bags from 10 feet away with a long-staff. The added weight makes it easier to maneuver a traditional staff, which is half the size. 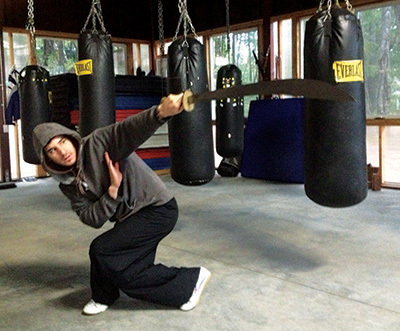 He's also practicing katas, or a series of choreographed movements and techniques, with a Chinese broadsword. Rodriguez came to Salmon Creek after meeting Dr. Yang at a seminar in Boston. His training partners had told him about an old Chinese master looking to take some guys into the mountains and train them for five years. Rodriguez was rejected the first time he applied to train here, but Dr. Yang gave him a second chance when a bunk opened up months later. He's one of the senior students now, having been there nearly from the beginning. "It's so different here, because you have school, work, friends, family, all in one place. In the city life, you have your home and your room where you can go and have your space. You choose to see your friends and family, unless you live with them. Here you're always in those circles and it's a pressure cooker," he says. "And at the same time, there's not really much you can do but self reflect. In your training sometimes you just want to take a break, and it's hard. You deal with yourself. It's all about demon conquering. But if you're really down for the art and you want to cultivate a strong spirit, then you just do it. You stop thinking about it at some point and just do it." Rodriguez works off his tuition with daily chores, but this intensive live-in training costs other students $10,000 a year. The annual application period for potential new students has just closed for the year, but Dr. Yang offers a free weekly training session each Sunday for locals. There are also daily, weekly, and monthly rates available for short-term students. You can find out more about YMAA's program offerings at www.ymaa-retreatcenter.org. For directions, call Dr. Yang at YMAA's Salmon Creek headquarters 707-502-8739.